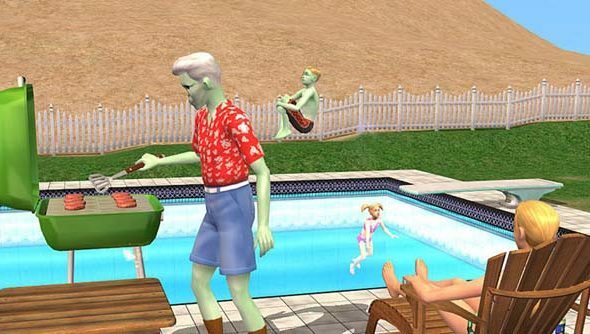 The recent hoo-hah about missing swimming pools and toddlers in The Sims 4 has only increased the relative cachet of Maxis’ 2004 opus. It was here that Will Wright and friends got their picket fence paradise spot on, just as they delivered on their rusk-to-reaper simulation for the first time. It’s a spot of bad timing, then, that EA have chosen now to discontinue support of The Sims 2. There’ll be no new updates for the game in the future – though Origin buyers will receive every expansion and Stuff pack to date by way of compensation. Every current owner of a digital copy of The Sims 2 will find the game’s Ultimate Collection in their Origin library within the next four days. Once it appears, you’ll be able to neaten up your ‘My Games’ tab by right-clicking on regular old Sims 2 and selecting ‘hide tile’. The Collection incorporates every expansion the game ever got – all eight of them. I’d recommend paying special attention to Open for Business: the last Sims release ever to come from Maxis, and the series at its most systemic and open-ended. Of course, not everybody owns a digital version of The Sims 2, which dramatically predates Origin. And it’s not clear where would-be players might purchase new copies: EA don’t sell the game on their own store. But if you happened to buy The Sims 2 during the correct year-span, you’re in luck. What do you remember about it? I know I was struck by the fact that Maxis had clearly hired some sorely-needed fashionistas and interior designers.